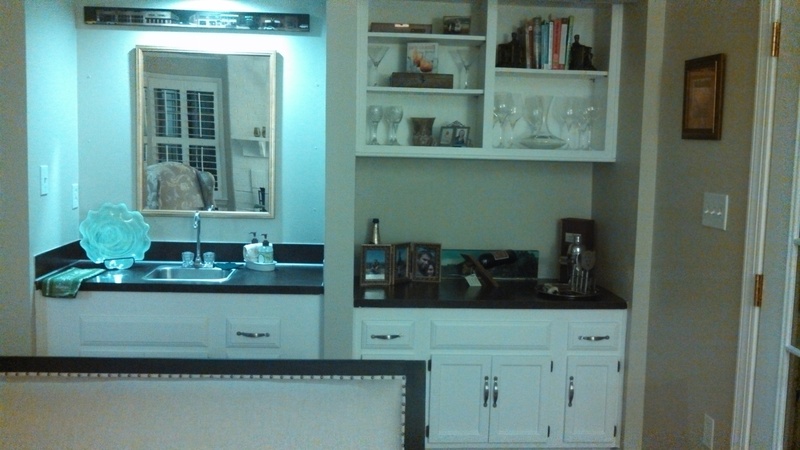 Title for this post is courtesy of my husband… and you’ll see the ‘why’ momentarily! On Saturday, we had a couple of friends (fellow Clemson alums) over to watch the Clemson / Wake Forest game, and in addition to chicken, potato salad, and green salad, I decided there could be no better time to break out my shiny new doughnut pan and my gluten free Cinnamon Sugar Doughnut mix (by Stonewall Kitchen, of course) for a yummy treat. While I’m not attempting a gluten free diet, I know plenty of people who are – and I was pretty impressed by the array of gluten free foods offered by Stonewall Kitchen. Stonewall Kitchen is a Maine-based company with a special story. Founded by two friends, Jim Stott and Jonathan King, their company ideals reflect the best of Maine – a strong sense of community, wholesomeness, and the unspoiled, natural beauty of the state (per Stonewall Kitchen website). They got their start at a local farmers’ market in 1991, selling out on their very first day. This initial indication certainly proved true – today, several expansions and moves later, Stonewall Kitchen serves 6,000 wholesale accounts, has 11 retail Company Stores, a Cooking School, and is regularly recognized for its outstanding specialty food products. Check out their website and try something – I’m sure you won’t be disappointed! Recently, I ordered this doughnut mix and the Carolina Rub for my husband, to bring a bit of Maine to his new passion for smoking. The recipe is very straightforward – in addition to the mix, you need only milk, one egg, and 2/3 cup of unsalted butter (1/3 cup for the doughnut mix, 1/3 cup for the topping). Directions: Grease or spray a 12-well doughnut pan (I only had a six-well pan, luckily – as I got halfway through the recipe before realizing I’d… forgotten the milk. That’s right, I managed to forget one of only three additional ingredients). Preheat oven to 400 degrees. 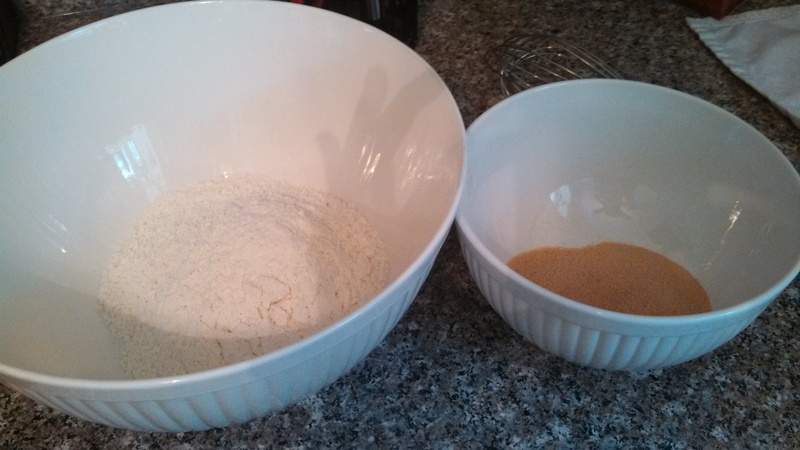 Pour doughnut mix into a bowl, and add milk, egg (beaten), and 1/3 cup melted butter. 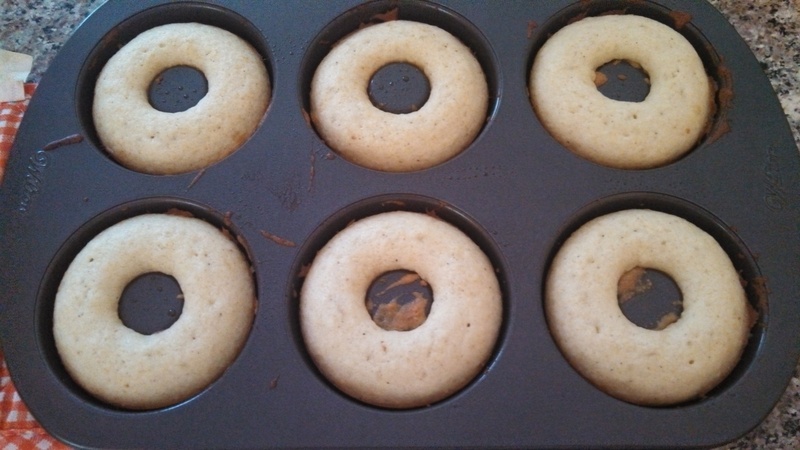 Pipe or spoon batter into doughnut pan, filling each cup 1/2 full. Bake 9-10 minutes, or until lightly browned. For the topping, pour the topping mix into a small bowl. Melt the additional 1/3 cup butter in a separate bowl. MUCH better! Milk… it does a doughnut good. 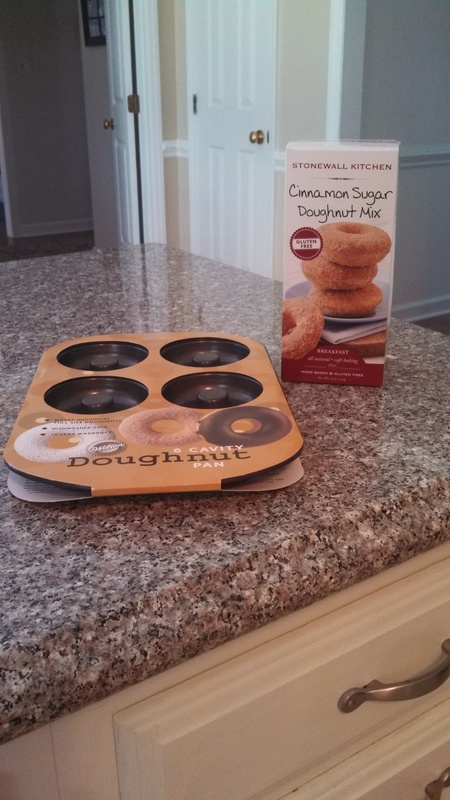 Remove doughnuts from the pan while still warm, and gently brush each with melted butter and then roll in cinnamon sugar mixture. Serve immediately. I’d say the difference is pretty clear, eh? 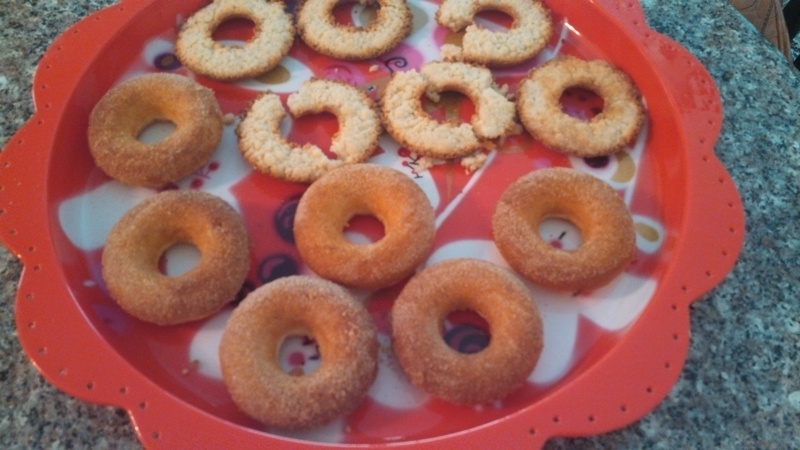 The doughnuts, and even the doughnookies (as we affectionately named my ‘whoops, no milk’ doughnuts) were a hit. Between the four of us, they were gone by the end of the night, and my friend’s husband said he actually preferred the doughnookies. Success all around! Thank you, Stonewall Kitchen. Categories: Drink, Eat, Holidays, Shop, Weekly Recipe | Tags: Cinnamon Sugar Doughnut mix, doughnuts, gluten free, Maine, recipe, Stonewall Kitchen, York | Permalink. Fresh paint and accessories work wonders! Thanks Mom, Dad, and Nick. For our family cookout, my mom and I chose this Brown Rice Salad with balsamic vinaigrette dressing from Recipes from the Maine Kitchen. It was a hit. In a sauce pan, bring water and salt to boil and stir in rice. Cover and reduce heat to low. Simmer 45-60 minutes or until rice is done. In a small bowl, combine vinegar, mustard, olive oil, and pepper. 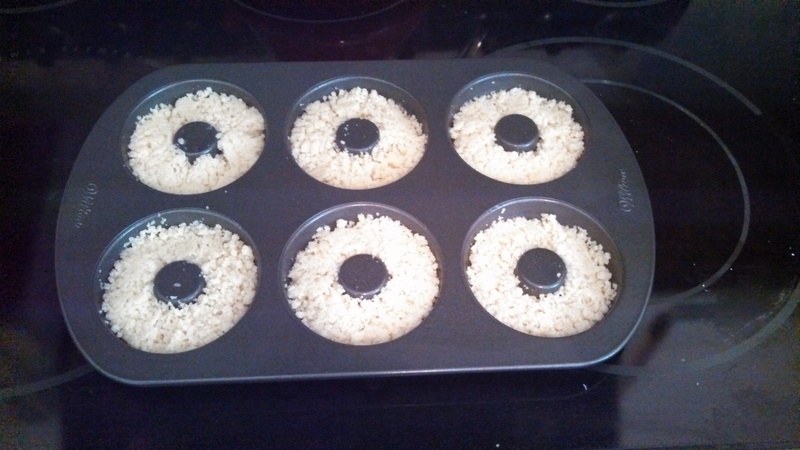 Mix thoroughly then pour over rice while the rice is still warm. Add tomatoes, olives, pepper and basil just before serving. Serve chilled or at room temperature (serves 8). I have to thank my mom for doing the honors and making this dish. I’m quite sure everyone now knows how much I value my family – but I can’t close this post without saying how much I appreciate them. Every time we’re together, I’m reminded of how lucky and blessed I am to have been born into this particular family. Thank you and I love you! 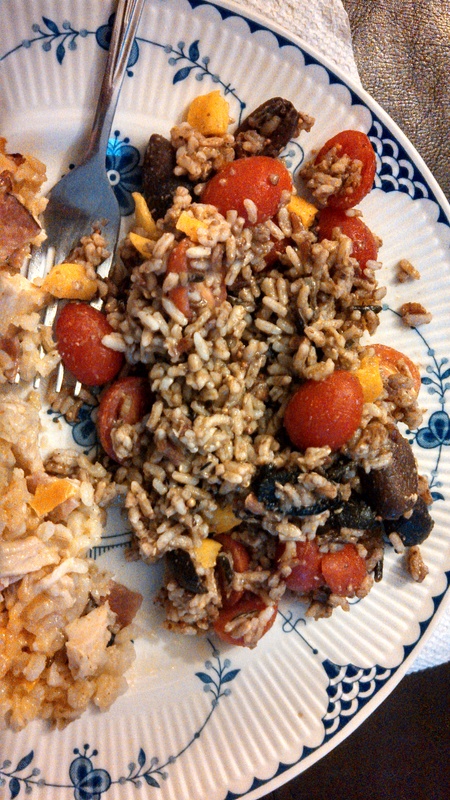 Categories: Eat, Play, Weekly Recipe | Tags: homecooking, Maine, rice, salad | Permalink. In follow up to my post on National Mead Day, I reached out to Sean Bailey, owner and mead maker at Fat Friar’s, to learn more about his business, mead making in general, and what makes Maine special to him and his family. While I won’t get to try mead for the first time for about another week (product reviews will follow then! ), I’m too enthusiastic about Sean’s business and this post to wait until then to share it. A Maine native, Sean’s interest in creating alcoholic beverages has its roots in his time as a serviceman – first in the Air Force, and again later in the Army. During those years, he was stationed in Germany and through his enjoyment of German beer, became interested in brewing it – he also met his wife, Dorothy, there, so you could say two loves were found overseas. He tried a beer making kit of his father’s, but refers to the results as a “crime against beer,” so Sean shifted his focus to wine making, exploring various fruit wines including blackberry and dandelion. These trials met with greater success, and when he first experienced honey wine, or honey schnapps (or mead), during a festival in Germany, his enthusiasm for mead making had him investing in a book, directions, and equipment. With the investment of time and resources, Sean says he became much, much better at the art of making mead. After leaving the military, Sean and Dorothy moved back to Newcastle, Maine. Sean began working in corrections, and following a particularly challenging work day, he popped open a bottle of his homemade mead and thought, “Gosh, I wish I could do this for a living.” At this point in our conversation, Sean told me about the military motto that originated with the British Special Air Service – “Who Dares, Wins.” He said this was the motto that sprang into his mind that evening – and so, he dared. He began the laborious, time-consuming process of obtaining licenses and navigating red tape, and upon completion, made his first sale to the Country Store in Newcastle. He says he was so excited, he left without receiving payment – and had to go back for it. Officially in business for three years, Fat Friar’s began with production of their Classic mead, and have since added two more flavors. Last fall, they added a fourth line with a holiday twist, which was Sean and Dorothy’s daughter’s idea. Today, they work with Mariner Beverage as a distributor and Sean remains involved in local sales and distribution. He is still a company of one (plus family members) – and he continues to maintain a full-time job in corrections. Dreams and dares take time and hard work! Perhaps my favorite part of the Fat Friar’s Meadery story is how they got their name. Sean describes himself as something of a dork – and one with a passion for history. One year for Halloween, he dressed up as Friar Tuck to take the kids trick-or-treating in town, and many of his friends jokingly called him the “Fat Friar.” As he and Dorothy struggled through the license application, particularly the business name, she recalled the moment and suggested Fat Friar’s – it stuck. Sean describes the sweetness of mead as similar to riesling, but it isn’t alike in acidity. When you smell it, the scent is very much of honey, but the flavor is dry (he aims for a semi-dry mead). It won’t be like anything you’ve had before – so take several sips before making up your mind! Please stop by Fat Friar’s some day soon and enjoy their new tasting area and outdoor space! Categories: Drink, Play, Shop | Tags: Fat Friar's Meadery, fermenting, honey wine, Maine, mead, Newcastle | Permalink. Although it feels a little early in the cold weather seasons to be sharing a chili recipe, Nick requested chili specifically for tonight – so here we are! 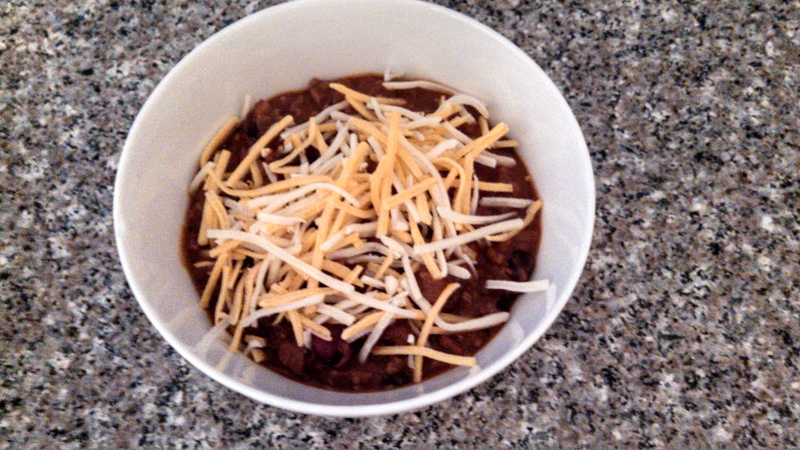 Chili is one of those dishes that I rarely follow a recipe for. Once you’ve made it a couple of times, you have the gist. However, there can be a vast difference between standard chili – pretty much always good – and really delicious chili. Since it is a Sunday and I had some extra time, I figured I’d see if I could find a chili recipe in one of my Maine cookbooks and give it a try. Leslie’s Chili, on page 95 of Maine Home Cooking, was the winner. Sandra Oliver’s intro to this recipe is what convinced me – her sentiments mirrored my own above – but she recalled having a particularly excellent chili at her friend Leslie’s house, so she tracked that recipe down to share with the rest of us. Brown the onion and garlic in a large, heavy pan. Add the meat and brown it, then add the rest of the ingredients and cook for 1/2 an hour or so. Taste occasionally and adjust seasoning. I added some chopped jalapenos (pickled) to mine, and served with shredded cheddar cheese on top. Leslie’s notes recommended using two colors of beans (for example, black beans and kidney beans), which I did. She also sometimes adds a bit of hot sauce. This chili recipe certainly hit the mark for me, and Nick said it was one of his favorites – it was really yummy and a clear step above your standard, thrown together chili. The other bonus for me was how quick it was – a little less than an hour total. My only (and very small) complaint is that I found the flavor to be a little too sweet. Next time, I’d go with 1/8 cup of sugar, rather than 1/4. Try it on a brisk fall evening or chilly winter night! Categories: Eat, Weekly Recipe | Tags: beans, chili, ground beef, home cooking, Leslie's Chili, Maine, Maine Home Cooking | Permalink. This weekend was an interesting, fun, and productive weekend for me – not just because the Clemson Tigers won (and are ranked #4!) and not just because the Patriots won (although not in the fashion I hoped they would) – but also because I made use of some things I had – and that was a great, fulfilling feeling. I don’t like letting things go to waste (a refrain I am sure you’ve heard all too often on this blog), but I think being resourceful, making use of what you have, is fundamentally important to personal happiness on one level and to the world on another. How is it fundamentally important to my personal happiness? When I make use of things I already have – food, clothes, home furnishings, or anything at all – it typically saves money and is practical, which in turn enhances my sense of independence and self-sufficiency. These feelings all contribute to making me happy. I think it’s important to the world in the sense of conserving and using resources in a responsible manner – and no, that’s not a statement about climate change or global warming. It should be simply common sense about what is good for all of us. But I’ll stay off my soapbox and instead tell you what I made use of… a ton of basil, garlic, tomatoes, pine nuts, onion, and more. 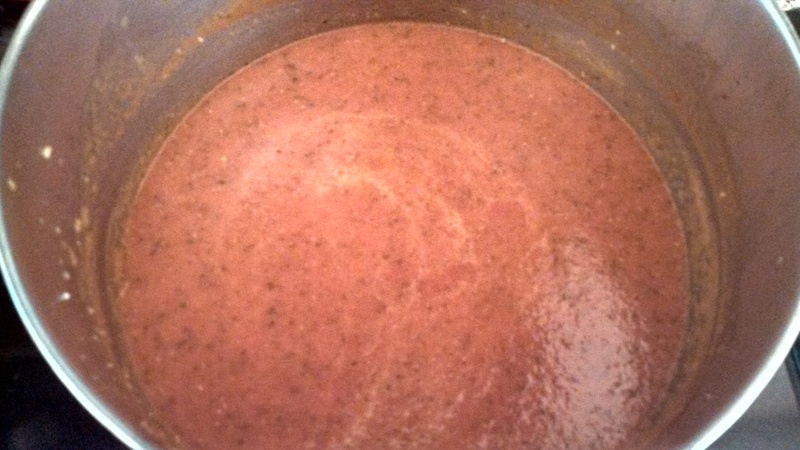 You guessed it – I spent the weekend making tomato sauce, which I’ve frozen for use over the winter (or whenever I need it), and pesto, some of which is frozen and some refrigerated. My herb garden was nearly synonymous with a weed garden before this weekend, with the basil and oregano growing wild, so I decided to pick up some tomatoes at the farmer’s market nearby and make homemade tomato sauce for future pasta nights. This idea grew quickly into making homemade pesto as well, because I knew I had much, much more basil than I could possibly use in tomato sauce alone. Both are simple, and if you have an herb garden and/or vegetable garden, this is a great way to turn less-than-beautiful (but perfectly nutritious) tomatoes into a future meal and store all that glorious basil so you can make use of it when the fresh stuff isn’t growing right outside your door (not to mention, store-bought pesto is quite pricey). 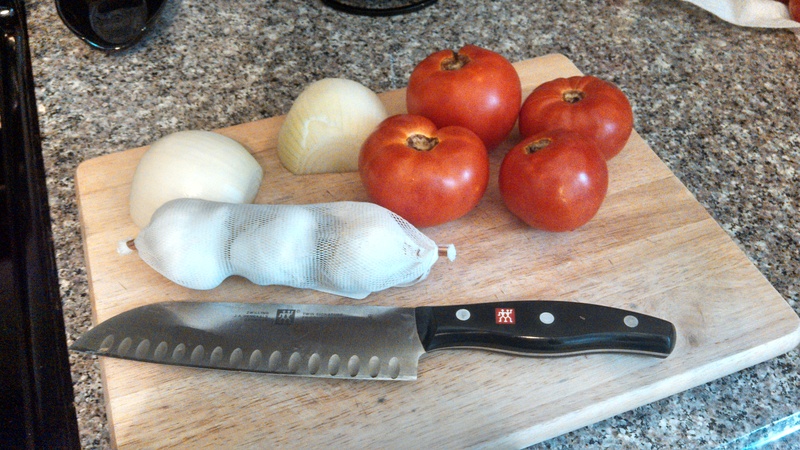 For my tomato sauce, I began by cutting up one onion and dicing some fresh garlic. In a large pot, I sauted the onion over medium high heat until translucent and added the garlic. I had purchased between 15-20 tomatoes, and I cored and quartered them. Some people like to peel and seed their tomatoes too – I don’t do this, because it’s a lot of effort and the seeds don’t bother me. I also leave the skin on for its nutritional benefit. 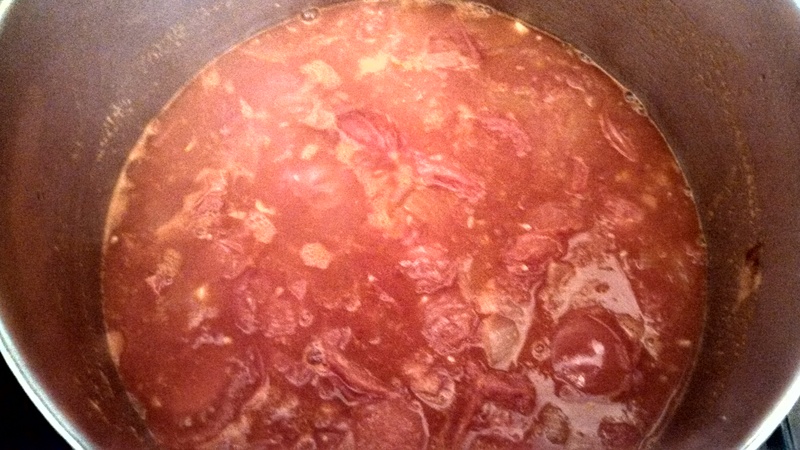 I added the tomatoes to the pot, with about a 1/4 cup of tomato juice and a big pinch of salt. 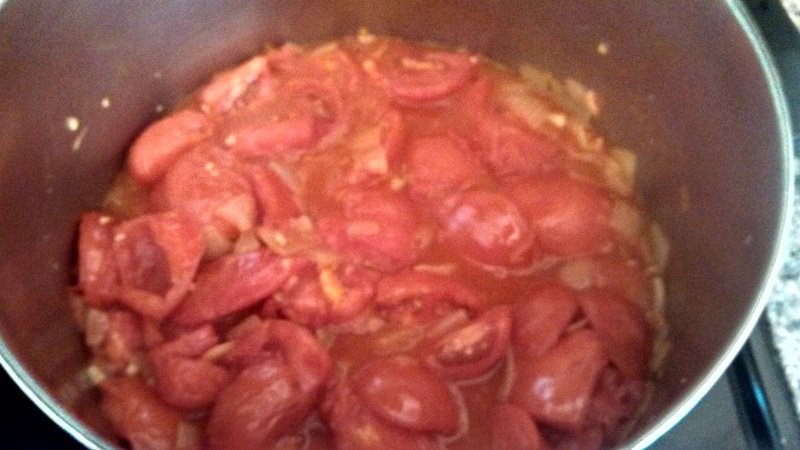 For best results, you want to simmer, stirring occasionally, until the tomatoes are quite broken down, as shown in the image below. I added about another cup of tomato juice at this point – and I wish I’d had about a tablespoon of tomato paste. Once your tomatoes look like this, remove from heat and let the liquid cool off. 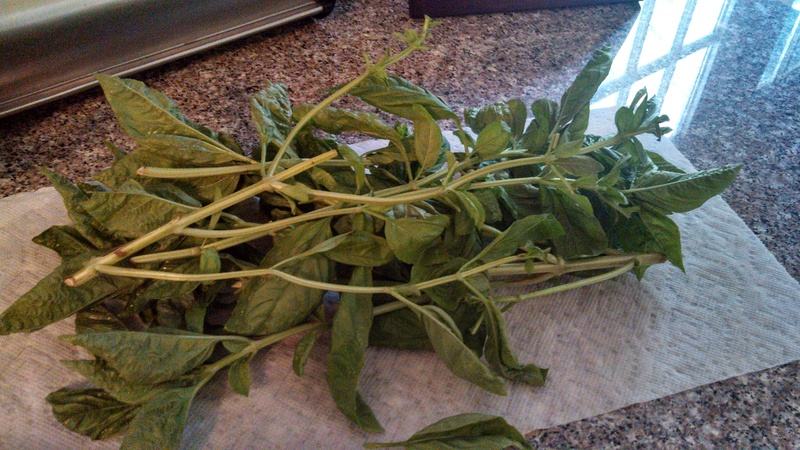 While it was cooling, I chopped up some fresh basil and oregano and added them. 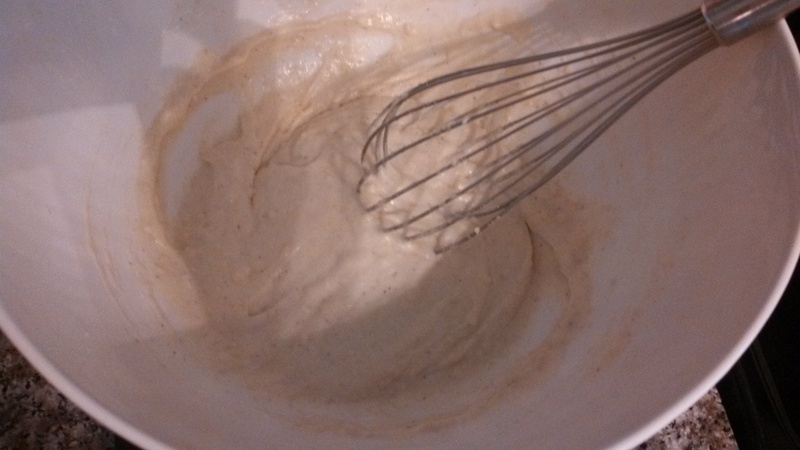 Once cool, I took out my immersion blender (one of my favorite kitchen tools), and blended until I had a nice texture. 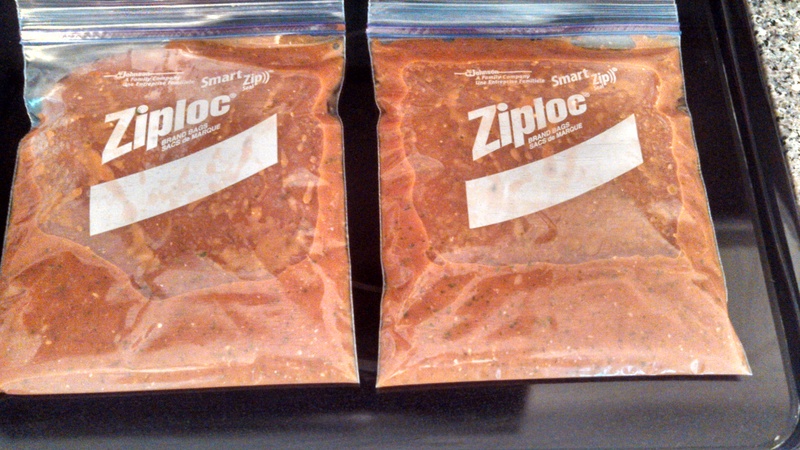 Then I packed it up in a couple of quart-sized freezer bags (setting aside some for a spaghetti sauce this week) and popped them in the freezer… a nice comforting addition to a future winter meal! Making pesto is a much shorter process. I made one batch with pistachios and one with pine nuts, because pine nuts are more expensive than some other nuts, and I like the pistachio flavor. I’ve also heard of people using walnuts as a replacement. 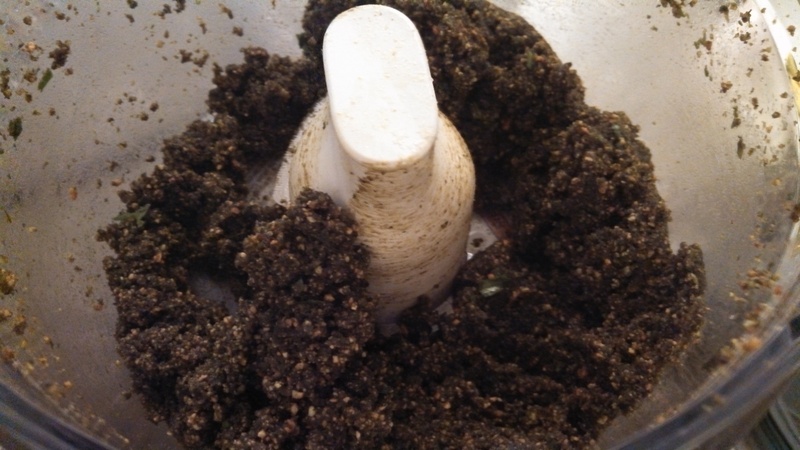 Take your basil, garlic, olive oil, your nut of choice, as well as a little salt and pepper, and process in a food processor (or blender, but I find the food processor much easier). Ironically, about 6 months ago, my food processor wasn’t working. Rather than look up the warranty right away, I lazily stuck it back in the cabinet intending to look for the warranty at some future time (which never came). 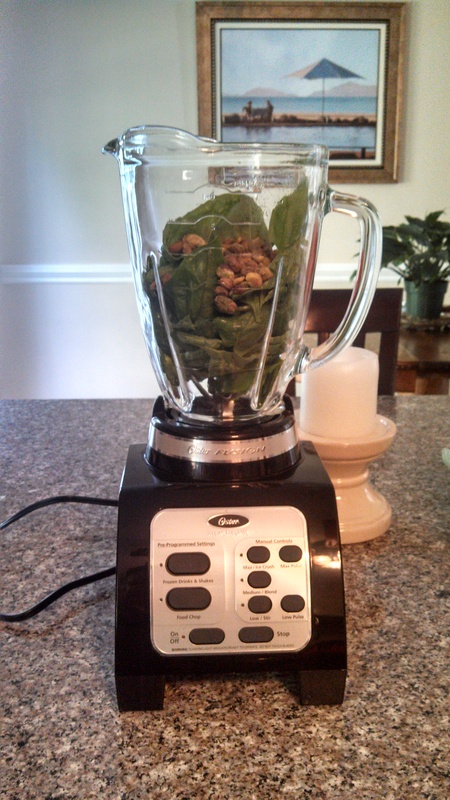 But this weekend, one of my biggest delights was when I pulled it out of the cabinet thinking, ‘what the heck… I really don’t want to use my blender, maybe it will work..” and it did! The end results are below. I was really pleased with both pestos and the flavor of the tomato sauce. Are you doing any freezing or canning to make your garden’s bounty last through the winter? Any other tips for making use of the things you already have? Categories: Eat, Play | Tags: basil, freezing, garlic, homemade tomato sauce, pesto, tomatoes | Permalink. Recently, I’ve been on a search for the perfect potato salad recipe. Potato salad is an ideal summer cookout side and transitions nicely into fall for football tailgates, but unfortunately for me, I’ve never been a big fan of potato salads with mayonnaise-based dressings (not a much of a mayo girl, in general). My aversion is so strong that I must admit I actively dislike and can’t bring myself to eat the premade deli potato salads that are practically swimming in the stuff. There have been breakthroughs – a few years ago, a friend of mine brought over potato salad made according to her mom’s recipe, which was incredible – it had a vinaigrette dressing and I seem to recall capers as well (although that could be wishful thinking). I would love to get my hands on this recipe, but in the meantime, I’ve made it my mission to find something similar that I may love even more, and I’ve had pretty good luck! Below, I’ll be sharing not one, but two potato salad recipes that I really like. One is from a Maine cookbook, true to form, but the other is not. They’re both delicious and I highly recommend them for your next cookout/tailgate/dinner/potato craving. One of these is the Roasted New Potato Salad from the Maine Summers Cookbook, found under the Sides section on page 150. Preheat the oven to 400 degrees. Place the potatoes on a baking pan large enough to hold them in a single layer and pour the coarse salt generously over them. Roast until tender but firm when pierced, 50-60 minutes. Sorry about the blurry phone photo! Remove the potatoes from the oven and using two pot holders, rub off the excess salt. 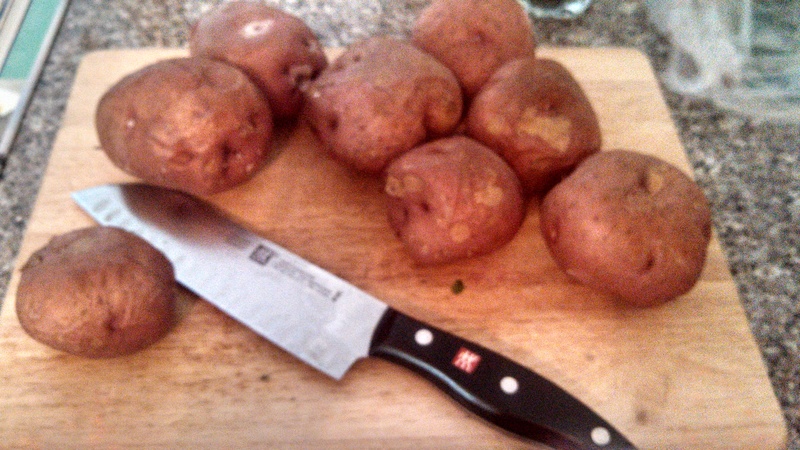 Place on a cutting board and cut into narrow slices (I opted to cube them, more like a traditional potato salad). If the potatoes are still very hot, keep one pot holder on. Transfer the slices to a bowl and immediately drizzle the white wine, 2 tablespoons of olive oil, and one tablespoon of vinegar over the potatoes. Toss and set aside. 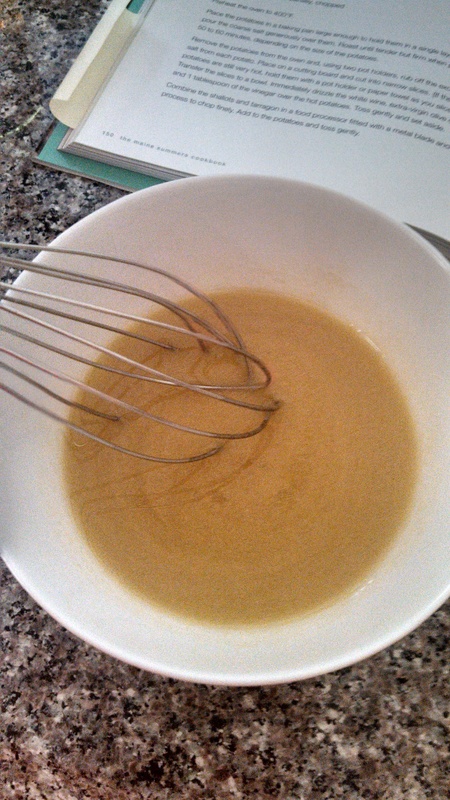 In a small bowl, whisk together the 3/4 cup of olive oil, the remaining two tablespoons of vinegar, and the mustard. Season with pepper, pour over the potatoes, and refrigerate for at least one hour (or up to 2 days). 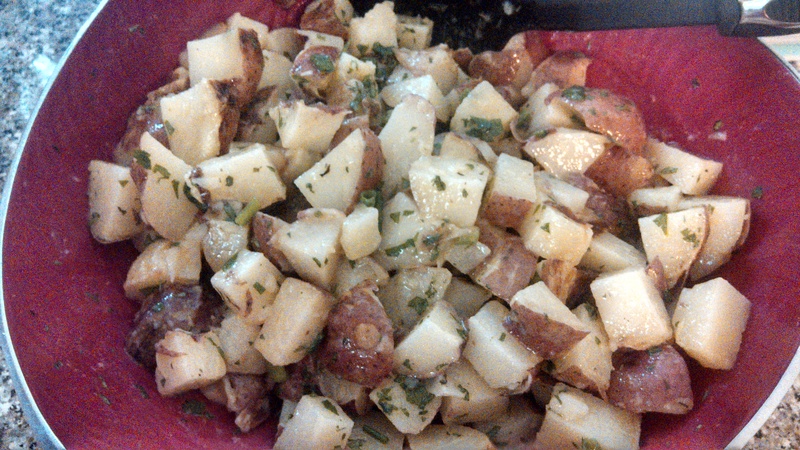 Prior to serving, remove the potato salad from the fridge and add the scallions and parsley, toss gently. This recipe serves approximately 8 people and was a big success at our house. I liked it – and the highest praise of all is when a guest asks for a copy of the recipe – which one did. The second comes from another cookbook that I use often for parties – The Big Book of Potluck. This cookbook was a gift from my mom and I’d highly recommend purchasing it. The recipe I tried is for French Potato Salad with Mustard Vinaigrette, on page 62. I really enjoyed this potato salad – but the recipe above kept better in terms of flavor and texture over the days following its preparation. You’ll notice there are many similarities between these two recipes – my tastes are apparently consistent! This recipe has three parts – the potato salad, the mustard vinaigrette dressing, and a Dijon-Basil mayonnaise, which is optional. Despite my dislike for mayo, I did make this and used it lightly as a dip – it was pretty delicious. For the potatoes: Bring the water to a boil in a medium saucepan, add salt, and lower heat to medium. Cook the potatoes, covered, about 20 minutes, until tender. Drain and cool under cold running water, and cut into bite-sized pieces. For the vinaigrette: In a small bowl, whisk together all ingredients (1/3 cup olive oil, white wine vinegar, 1 teaspoon fresh lemon juice, garlic, 1 tablespoon Dijon mustard, tarragon, oregano, salt, and pepper). Put potatoes, green onions, and parsley in a bowl. Add the vinaigrette and toss lightly. Cover and refrigerate for 6-8 hours. Accompany with a bowl of the Dijon-Basil mayonnaise if desired, so guests can top their servings with a dollop. For the Dijon-Basil mayonnaise: In a small bowl whisk together all ingredients (mayo, nonfat yogurt,1 tablespoon Dijon mustard, 1 teaspoon fresh lemon juice, basil) until well blended, and cover and refrigerate until ready to serve. If you try one of these, let me know your thoughts! I am sure you’ll enjoy them both. Categories: Eat, Weekly Recipe | Tags: Maine, Maine Summers Cookbook, potato salad, recipe, roasted potatoes, side dish, The Big Book of Potluck | Permalink. Growing up in Maine means falls filled with foliage and apple picking. To this day, the smell of apples at any time of year – in an orchard, freshly sliced, baking in some delicious treat – makes me think of fall and the oncoming winter. Apple pie (homemade) is still my favorite dessert… so stay tuned for an upcoming weekly recipe featuring apple pie. With the beginning of September, apple picking season in Maine has kicked off and is entering full swing. In fact, next Sunday, September 8th, is Maine Apple Sunday. There is no shortage of orchards to visit to participate in apple picking, cider, hayrides, and other fun activities. Visit this orchard map from maineapples.org to find one close to you. Most of the information and links in this post come from maineapples.org, the website of the Maine State Pomological Society. 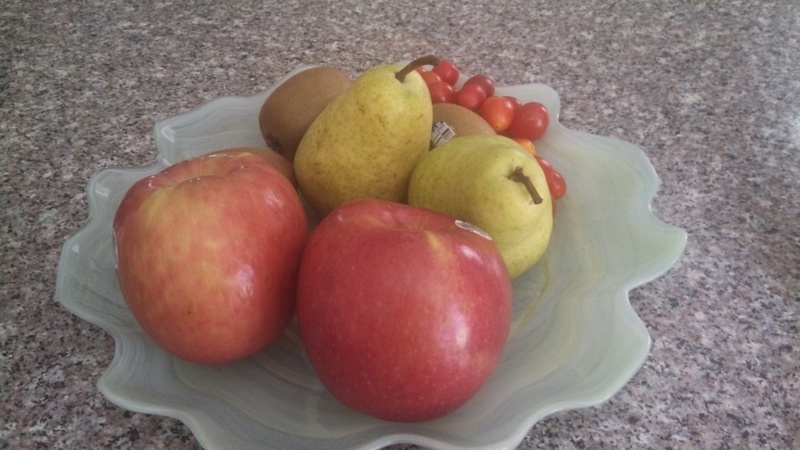 My husband and I have been working to include more fruit in our diets, so apples have become a staple in the fruit bowl at our house. I was interested to learn that his favorite variety, Honeycrisp, is one of the primary apple varieties grown in Maine. While over 100 varieties are grown in the state, the McIntosh (which is the most commonly grown apple throughout New England), and more recently the Cortland, Macoun, and Honeycrisp are popular. Two apple varieties that originated in Maine are the Black Oxford and Brock, although these are lesser known. The apple is a fruit with a long history, as well as a significant role in mythology and religion of various cultures. Apples have been grown for thousands of years in Asia and Europe and were brought to North America by colonists. A Massachusetts man, John Chapman, gained fame for planting apple trees throughout Ohio, Indiana, and Illinois – he became known as Johnny Appleseed. We’ve all heard the expression “an apple a day keeps the doctor away,” and apples do indeed offer good nutrition. The skin of an apple is high in fiber, while the apple itself is low in calories, and includes phyto-nutrients and antioxidants. Apples have good quantities of vitamin C and beta-carotene as well as B-complex vitamins. Personally, I love dipping apple slices in natural peanut butter – as a runner, this is a tasty and healthy way for me to immediately refuel with carbs and protein, and the fiber helps keep me full until mealtime. Do you have a favorite orchard to visit in Maine? A great recipe for me to try?